Tunia was founded in 2008 thanks to the combined enthusiasm of three young people (up to 40 we are still considered young! ): Chiara Innocenti and brother and sister, Francesca and Andrea Di Benedetto. When choosing our company’s name we wanted something that would pay tribute to the territory that welcomed us, the land of Chimera and Minerva, and so we selected Tunia , who was actually one of the most important goddesses of the Etruscan pantheon and, by coincidence (!) watched over the ripening of fruits. 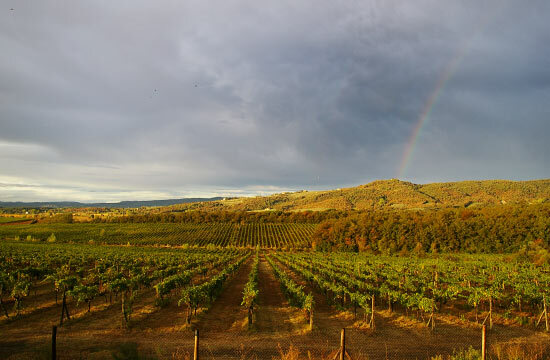 Tunia covers 25 hectares in the heart of Val di Chiana ,with woods and hills covered in vines and olive trees. The Castle of Dorna, a Lombard construction where wine has been produced from the dawn of time, stands as a backdrop to the property. The property is bordered by woods and the Chiassobuio River. The vineyard comprises mostly the older vines of Sangiovese and Trebbiano, planted in 1970, but we also have Cabernet Sauvignon and Sangiovese that were planted in 2005. The skilled hands of a “master grafter” have recently grafted a small part of the older Trebbiano vines with Vermentino. The remaining land has 600 Leccino and Moraiolo olive trees. We have chosen to use organic farming methods when managing our land and the wine is produced in the cellar without the addition of any substance apart from a small quantity of sulphites at bottling.